Yesterday, we introduced a new player on the worldwide footwear fashion stage: the Aggressive Shoe. Like many runway styles, the Agro-Shoe looks great on celebrities, models, and paper, but requires a little work to translate into everyday fashion. If you work in a place that accepts punk-rock shoes with menacing studs, more power to you. If, however, you must fuse fashion with a professional appearance, you’ll need an Aggressive Shoe that’s slightly less in-your-face. You need a subtle way to give it to The Man. It must be so subtle that The Man might even dole out a compliment or two, completely unaware that what he admires is in fact a sign of secret rebellion. It seems nearly every paper in America chose to run a recent AP story on the new aggressive style of shoe. I present article Exhibit A, from The News Tribune out of Tacoma. This story is in online editions from Taiwan to Canada. I congratulate AP writer Samantha Critchell for her global reach. Ms. Critchell writes, “The ‘it’ bag has been replaced by the ‘it’ shoe, says Nicole Fischelis, the group vice president of ready-to-wear fashion for Macy’s. ‘The aggressive shoe is not a new phenomenon. It’s been on the runway for a few seasons, but it’s more apparent because of the rocker-chick kind of mood that’s coming back into fashion.’” Just what does an Aggressive Shoe look like, you ask? Q: What do you get when you mix a broke dude, a uncannily clever cat and a pair of killer boots? 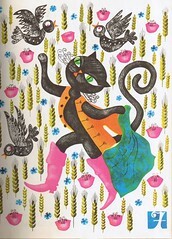 A: Today’s Shoe Fairy Tale, “Puss-In-Boots.” This beloved tale has a marvelously modern, lighthearted moral: the boots make the man. Or the cat, apparently.